Also known as "Les Couleurs de mon père : un portrait de Sam Borenstein"
"With great singleness of purpose, Sam Borenstein painted for over 40 years. Despite his obvious talent it was only near the end of his life that his work began to be known. 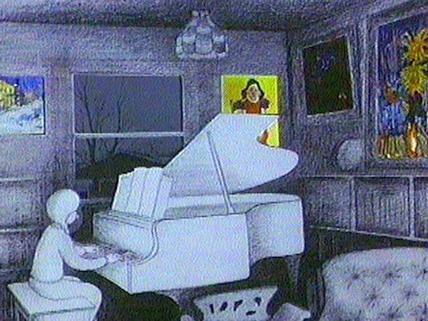 Twenty years after the artist's death, animation filmmaker Joyce Borenstein brings her father's work to a wider audience. Using various animation techniques in this documentary, she skillfully and harmoniously integrates archival material, filmed sequences, the painting themselves, and reminiscences of friends and family, to bring Sam Borenstein's work to life." Nominated for an Academy Award in the Documentary (Short Subject) category. "Cette façon d'illustrer mes personnages [par des contours et des silhouettes] traduit l'essentiel. Lorsqu'on évoque des souvenirs ou de la nostalgie, on laisse tomber les détails." National Film Board of Canada. "NFB -- The Colours of My Father: A Portrait of Sam Borenstein." National Film Board of Canada. http://onf-nfb.gc.ca/en/our-collection/?idfilm=18473.